It's been quite some time since our last SSD roundup and we hadn't seen much need for one until recently. SSD technology grew stale after saturating the SATA 6Gb/s bus, bringing mostly minor improvements in recent memory and making up for it with price cuts. Standing as one of today's fastest SATA SSDs, if not the fastest, Samsung's SSD 850 Pro arrived almost a year ago now. At that time the 512GB version was roughly $0.83 per gigabyte whereas today that same model costs just $0.60 per gigabyte -- down nearly 30%. While Samsung secured the high-end market with its 850 Pro, Crucial's MX100 dominated the value segment with its 512GB model fetching just $0.44 per gig. The MX100 was already too good to refuse and now we have the MX200 with the same competitive performance for a slightly cheaper $0.39 per gig. 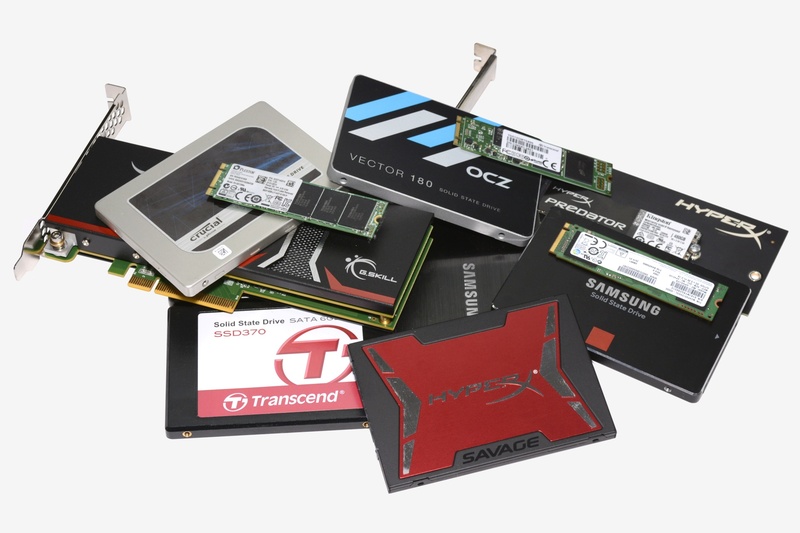 Samsung's SSD 850 Evo and Crucial's bargain basement BX100 have also recently been thrown into the mix, while OCZ is trying to find a groove with its Vector 180 and SanDisk is still plucking away with the Extreme Pro. Kingston recently threw down with the HyperX Savage, pricing it between Samsung's SSD 850 Pro and 850 Evo series, and the company also has the ultra-fast HyperX Predator PCIe SSD in its arsenal, which is considerably cheaper than the Plextor PX-G512M6e 512GB. We also have G.Skill's Phoenix Blade on hand, another PCIe SSD powered by four SandForce SF-2282 controllers using RAID. This is essentially what we saw last year when testing the OCZ RevoDrive 350, though the Phoenix Blade is faster and slightly cheaper than OCZ's version. At the top of the food chain are Samsung's SM951 and Intel's SSD 750 Series. The SM951 is an M.2 series intended for OEM channels, but as we recently discovered in our SM951 review, it's possible to buy Samsung's PCIe drive separate from an OEM system via RamCity. Meanwhile, Intel's SSD 750 Series is widely available but it's limited to 400GB and 1.2TB capacities -- we have the former for this article. This roundup covers consumer-grade SSDs that use either the SATA, PCI Express or M.2 interface. As always, we'll be looking at price vs. performance to see where each product stands. The Samsung SSD 850 Pro proves that it's possible for a SATA SSD to reach 364MB/s in our single large file copy test. The SanDisk Extreme Pro also performs well in this test delivering 342MB/s, and while the Plextor M6e wasn't a great deal slower for an expensive M.2 SSD, it was rather slow. The 'affordable' SSDs such as the Crucial MX200/BX100, Transcend SSD370 and so on delivered between 210-250MB/s, with the MX200 being 32% slower than the SSD 850 Pro while only costing 13% less per GB. Stepping up from the Samsung SSD 850 Pro we have the G.Skill Phoenix Blade PCIe SSD which delivered a solid 508MB/s (40% faster). That said, the more affordable Kingston Predator PCIe SSD was 10% faster than the Phoenix Blade with 557MB/s. We see another large performance jump when looking at the Intel SSD 750 Series, which sustained 654MB/s to be 17% faster than the Kingston Predator and 80% faster than the Samsung SSD 850 Pro. However, putting the Intel SSD 750 Series to shame is the Samsung SM951 512GB with an impressive 750MB/s, more than twice as fast as the SSD 850 Pro and 15% faster than the SSD 750 Series. The program copy test is comprised of many small non-compressed files ranging from just 1K up to 5000K in size (6104 files totaling 2.75GB). The program copy test shows the majority of the SATA SSDs delivering between 185-205MB/s and that range includes such models as the Kingston HyperX Savage, Samsung SSD 850 Evo, Transcend SSD370, Crucial MX200/BX100 and OCZ Vector 180. Again, the only SATA SSDs to break away from the pack were the SanDisk Extreme Pro and Samsung SSD 850 Pro. This time the G.Skill Phoenix Blade PCIe SSD was able to beat the Kingston Predator PCIe SSD by an 11% margin. The Intel SSD 750 Series was slightly faster again delivering 7% more performance than the Phoenix Blade. Once again at the top of our chart is the Samsung SM951 with 476MB/s making it 16% faster than the Intel SSD 750 Series and 83% faster than the SSD 850 Pro. Our last file copy test uses game data in a mixture of small and large, compressed and non-compressed files. This time the Samsung SM951 reached 790MB/s, 17% faster than the Intel SSD 750 Series and more than twice as fast as the SSD 850 Pro. The G.Skill Phoenix Blade PCIe SSD crushed the Kingston Predator PCIe SSD by a 29% margin though the Predator was still 37% faster than the fastest SATA SSD being the Samsung SSD 850 Pro. Speaking of which, with 350MB/s the SSD 850 Pro was just 4% faster than the SanDisk Extreme Pro and 16% faster than the SSD 850 Evo. Again, the majority of the SATA SSDs delivered between 250-270MB/s with up to just 20MB/s separating them.